Our Trinity team had a pleasure to visit Krakow, our partner city. We sent 6 representatives of our city. They had 1 week to do some sightseeing, learn polish language, try polish cuisine and relax near the lake. Summer in Krakow was prepared to show them as much as possible. Here you have relation from the trip. After landing in Balice airport our travelers were taken to the hotel in the city center. They booked a transfer with KrakowDirect company. They had some time to refresh in their rooms and later on traditional polish food was waiting for them in old- fashioned restaurant. In the evening they had free time, but our polish friend Kasia offerend to show them Main Square. She said it’s different in the night. Atmosphere is changing. All those lights from the pubs, people singing in different languages, illuminated Sukiennice… This informal visit in Krakow was really attractive. 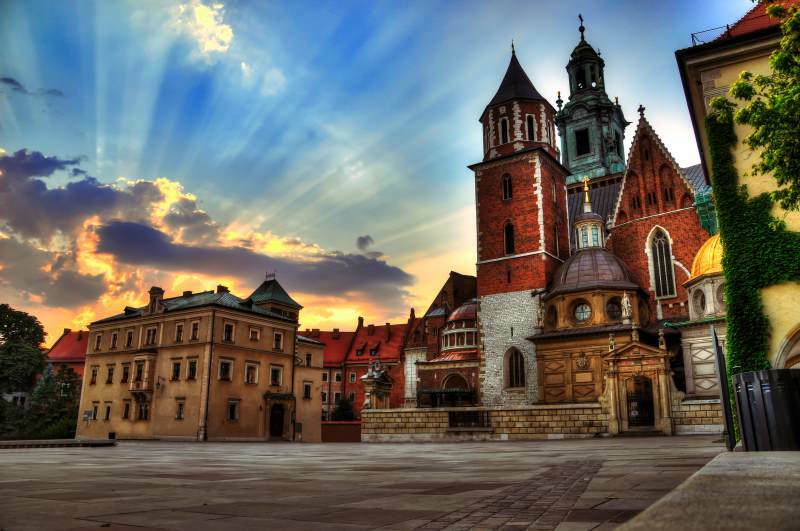 During your visit in Krakow you have to see Wawel Castle! In Krakow electric cars called Melex are slowly taking tourists around the city. Our guys with English speaking guide saw the city center and heard interesting stories about this old place. Most impressive was Wawel castle, Dragon Wawelski and his cave. This place where polish kings were living and legendary beast hidden under the hill were amazing. Royal chambers seemed untouched by time. And the graves of the kings… Of course our team bought plush dragon toys. After delicious polish meal for the breakfast it was time for museums. The plan was to see National Museum, Czartoryski Museum and Historical Museum of Krakow. In the end of the day our team had a supper with folk show. Live music and dances in traditional costumes encharmed everyone. I guess Auschwitz- Birkenau Concentration camps are something everyone should see during their visit in Krakow. We woke up early and a car took us around 40 kilometers from Krakow. Some of us cried. The rest had chills. We were deeply moved to see this fabric of death. When the guide was telling us thrilling stories about murders and tortures which took place in here… Those concentration camps were build on polish lands by Nazi who occupied Poland. The aim of the Auschwitz camp was to exterminate Jews, Slavs, homosexuals and political prisoners. Around 1 million people were killed in here. 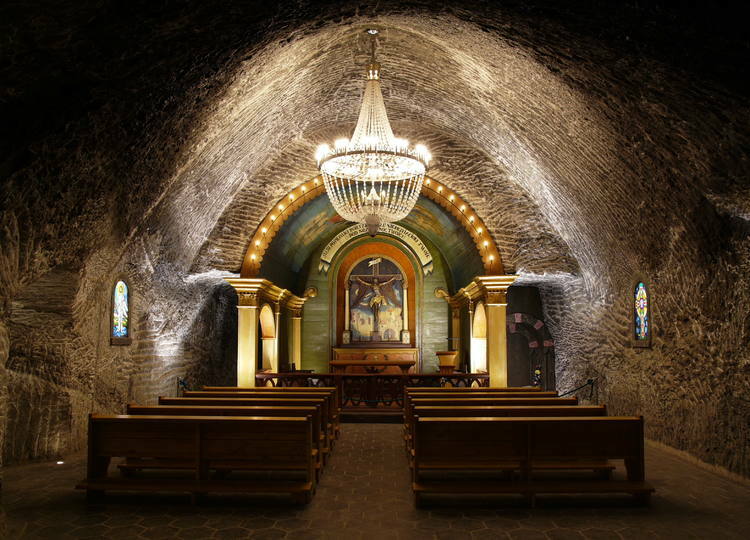 Later the driver took us to Wieliczka Salt Mine. It’s really beautiful place. We were walking underground, admiring salt chambers. Stories about miners who worked here, lost their lives seemed to be hidden in those white walls. And the legends of Hungarian princess Kinga! It’s good to hear how this local hero showed her generosity, goodness and wise management of the region. Especially in the times, when women didn’t mean much. Since it’s strongly connected subject to the city we decided to get closer to this issue. We took Krakow guide who showed us Podgorze district. Jews were transferred from Kazimierz in here to ghetto. Parts of the walls are still standing. Jewish Ghetto in Krakow was the place where the worst of the holocaust in the city happened. Seventy years ago, the Krakow ghetto was ruthlessly emptied and most of its residents sent to the gas chambers. Our next step was Schindler’s Factory, which was the best of all. It’s modern museum, which reconstructs Krakow from occupation times. It documents a story of 1000 Jews, who worked for Schindler and whom he has rescued. We also wanted to see Krakow Concentration Camp, where Jews were forced to work. He went to Plaszow, which is another district of Krakow. After 3 hours of travelling, our american team reached a city in the heart of mountains. We have seen people in traditional clothes, tried local cuisine, hugged a sheep… Amazing Siklawica waterfall made an impression on us. We were also in Tatra Museum. Some of us decided to climb on Gubalowka, while others were enjoying sunny weather without hiking. We came back so tired, that we slept all the way back to the hotel! 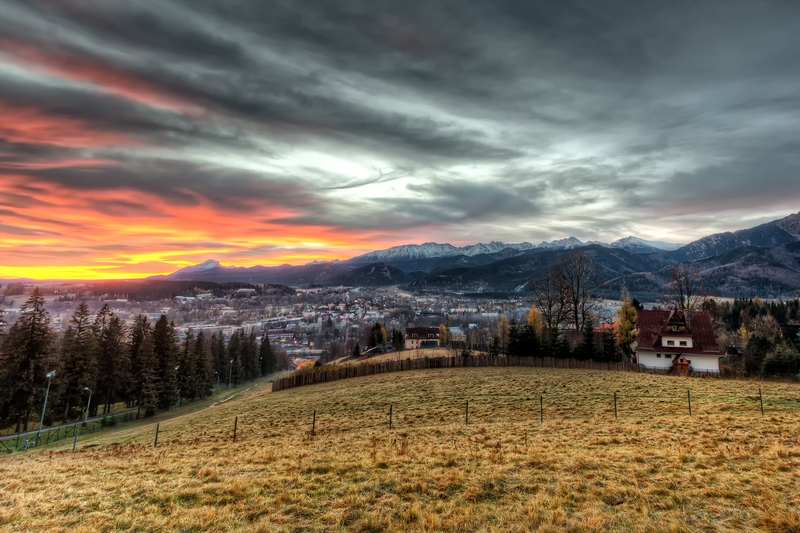 Zakopane is known from beautiful landscapes. Although our flight was in the next day, we kept in mind that it’s over. So we decided to walk around Kazimierz, drink coffee, eat a cake… We even entered a Synagogue. It’s been Jewish area, but after the war original inhabitants run away or were killed. Old tenements, charming cafes and restaurants are attracting people who come here. For the last time we bought obwarzanek and after lunch we went back to take our luggage. Our visit in Krakow was over… We left early in the mourning next day. It was wonderful trip. Every day something interesting was happening. We had an opportunity to see Europe and our partner city. We hope polish team who will come to Trinity in USA will also enjoy their stay! I was in Krakow during my Euro trip! Amazing place, amazing people and the views… I wish I could go there again! Hope you enjoyed as much as me.